I am sure this place has been reviewed by all Sydney food bloggers and many of you have probably eaten / been here many many times! I for one, have been here a number of times now and have enjoyed every single meal! I first discovered Din Tai Fung in Singapore, about 5 years ago and absolutely loved their dumplings – xiao long bau to be exact! So when it finally hit Sydney, I was eager to try. I remember coming here the first couple of weeks it opened in Sydney and the queue was unbelievable! Over 45 mins plus, talk about insane! It’s not as bad now, but still be prepared to wait! Came here for lunch one day with S1, my colleague, and S2, an ex colleague of mine whom I have kept in contact with. S2 has a gorgeous daughter, M, she has the most amazing blue eyes and is such a bundle of joy! So happy, so energetic and so SO cute! S1 and I came here a tad late, about 12.30pm and there were already a long queue! We had to wait about 20 mins, which is really not too bad. They both left it up to me to order, which could be a dangerous thing! 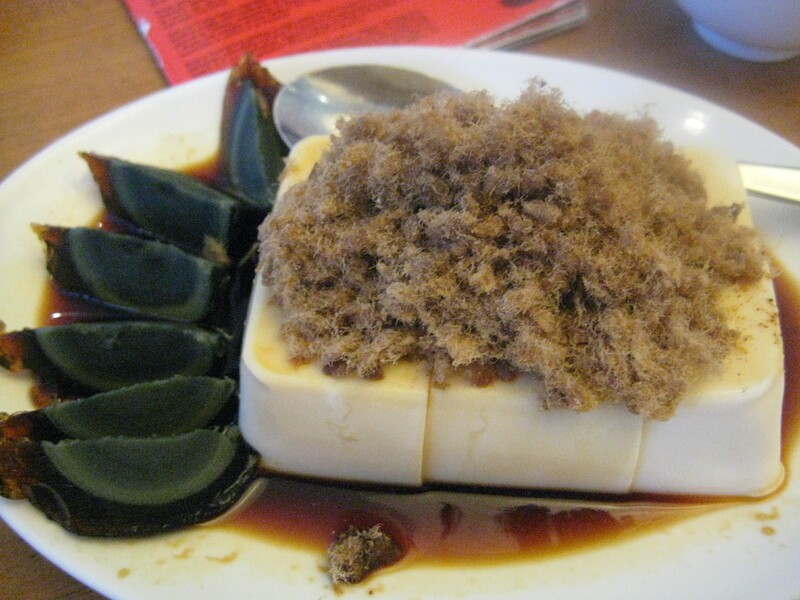 We started off with the silken tofu with pork floss and a thousand year old egg. This is one of my favourite dish. The silken tofu was cold, which took S1 by surprised, he thought it would be warm tofu. His comments were ‘you need a lot of pork floss and a lot of sauce’. I then asked him about the thousand year old egg and he said ‘its interesting and creamy’ hahahah it was the first time he had ever tasted the thousand year old egg. S2 didn’t dare try it – she thought it looked too weird! Next came pork and prawn dumpling in chili sauce. These slippery dumplings were just incredible. The combination of pork and prawn were fantastic, and the chili really gave it a nice touch. I had to add more chili as it wasn’t spicy enough but it was great. We ordered a couple of their famous xiao long bau. 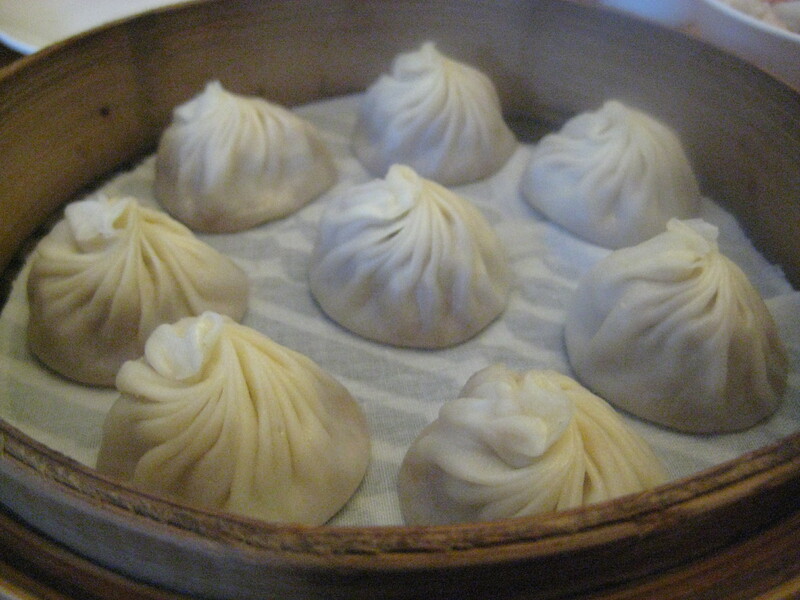 Ordered two servings of the steamed pork dumpings and one of the steamed crab meat and pork dumplings. I think the pork dumplings were the favourites amongst the diners. You have to be careful when eating these xiao long bau – eaten when too hot could be serious catastrophic for your mouth and / or your neighbour (i.e. 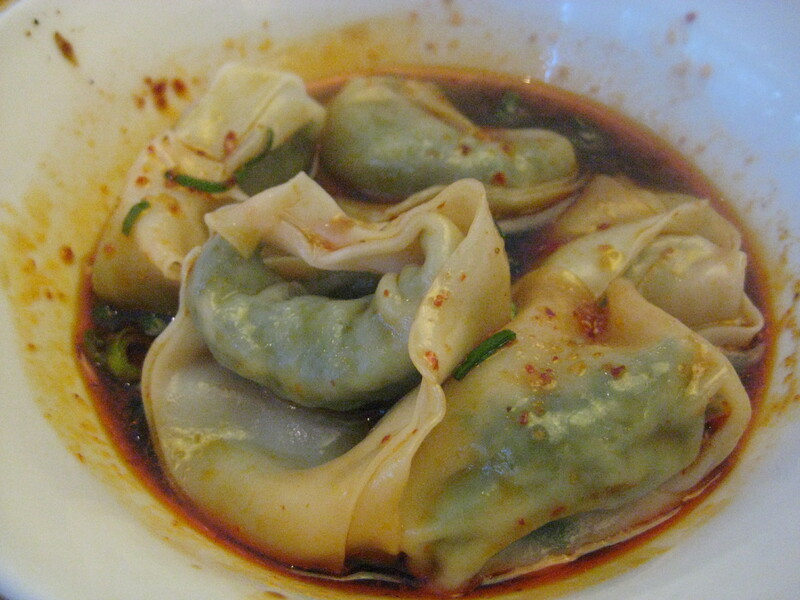 you could squirt juice out of the dumplings into your neighbour!). 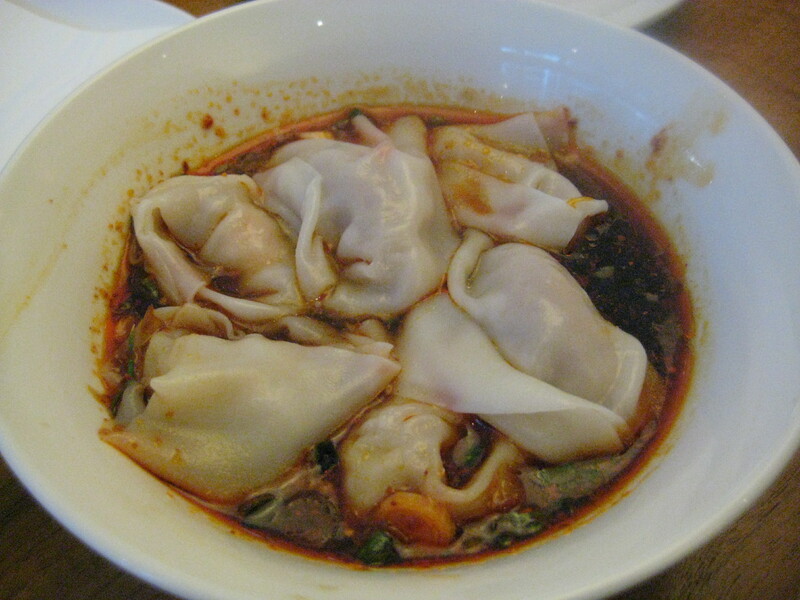 I personally like to eat my xiao long bau, drenched in vinegar with a serious amount of chili! The sourness from the vinegar really gives it a nice tangy flavour and a nice ‘kick’, but that’s just me. Both S1 and S2 ate it with soy sauce. We also ordered a bowl of pork and vegetable dumplings in chili sauce. I thought the pork and prawn was definitely better. It was a lot smoother, the pork and vegetable were a little rough. The next dish, cucumber salad was seriously better than I anticipated. 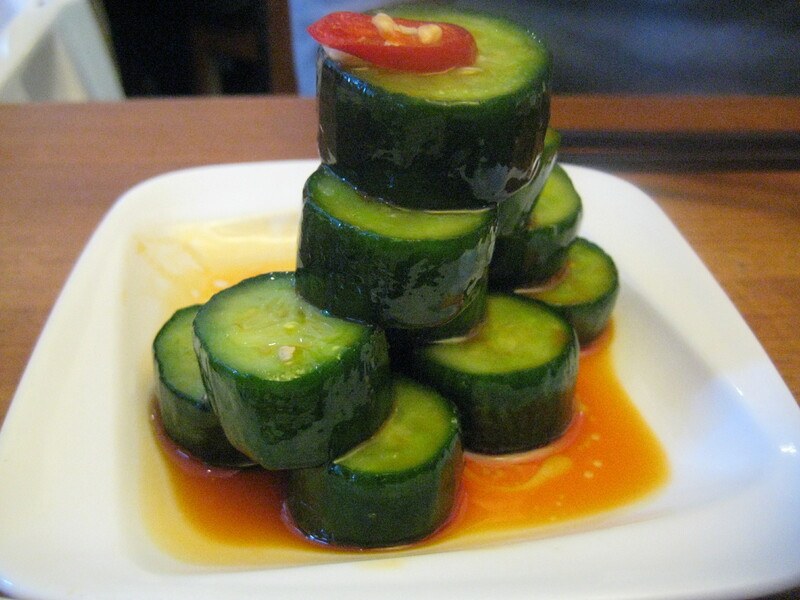 Cucumber fresh, served with vinegar and chili oily, it was unbelievably tasty. I really enjoyed this dish – it was refreshing and light – it really cleansed the palate. We came out stuffed and satisfied. Both S1 and S2 really enjoyed it. I also enjoyed it but forgot how expensive it was compare to Taiwan / Singapore. Still – it was great food and nice to catch up with both of them. Make sure you come early, before rush hour! If you come late, be prepared to wait for at least 30 – 45 mins! We were lucky that we only had to wait 20 mins, I have waited for 40 mins before… is it worth the wait? 40 mins is a little excessive, I don’t think I would wait that long for any food! 20 mins – yes, definitely worth the wait! I still haven’t been yet.. a terrible aversion to queues, but you’re right, seems like every food blogger has done DTF… will make it my new year’s resolution.. 365 days surely I will find one day to fit in their dumplings!